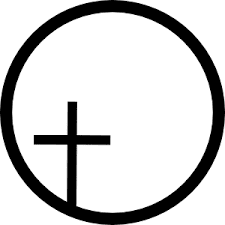 Until I read Richard Trudeau's book Universalism 101 I had not known about the off center cross symbol of Universalism. The symbol was adopted by the Massachusetts Universalist Convention in 1947. As I have matured I have come to understand that most so called Christians do not understand Jesus's message and teachings and they certainly don't apply them in their lives. The sign of the cross is not a symbol of expiation, suffering, torture and death, but rather the opposite, a symbol of triumph, transcendence, patient compassion, and the resurrection of the spirit with the eschewing of the body. The Universalist symbol acknowledges the importance of Christian teachings while leaving plenty of room for other traditions and sources as well, that's why the cross is off center, to make room for other paths. Having learned of the off center cross symbol I have come to love it more than the flaming chalice. For someone with my background as a former Roman Catholic it respects and supports my positive religious experience with Catholicism while leaving plenty of room for other experiences as well. The flaming chalice is a wonderful symbol as well indicating the divine spark in each one of us and the whole world. Perhaps I can have both. Why do I have to choose? Could I put the flaming chalice within the circle with the off center cross? The abandonment of Jesus as a great spiritual teacher has been a real set back for UU. It needs to recover its roots if it is to flourish in the coming decades. Jesus had some revolutionary things to say which are largely ignored by society. I think it is perfectly alright to put the flaming chalice in the circle with the cross. I love this blog. The articles say so many important things. Thank you for all your work.